Leave Panama City via the Puente de Las Americas exit (Bridge of the Americas) and take the Pan American Highway to Devisa. At Devisa, take the Chitre road and keep continue through Chitre and Las Tablas to Pedasi. The whole journey takes approximately 4 hours. Get directions here. Go to the Albrook Bus Terminal and catch a bus every 45 minutes to Las Tablas. From Las Tablas it is an inexpensive, 25 minute cab ride to Pedasi. Total cost for bus and taxi is about $35 with travel time of about 5 – 5.5 hours. We are the first hotel on your left as you enter Pedasi. We are located on Calle Principal across from the police station. We have secure gated parking. To make a reservation or ask any questions please send an email to casalajagua@gmail.com or call us at +507.995.2912. You can also fill out the contact form to check availability for your travel dates. 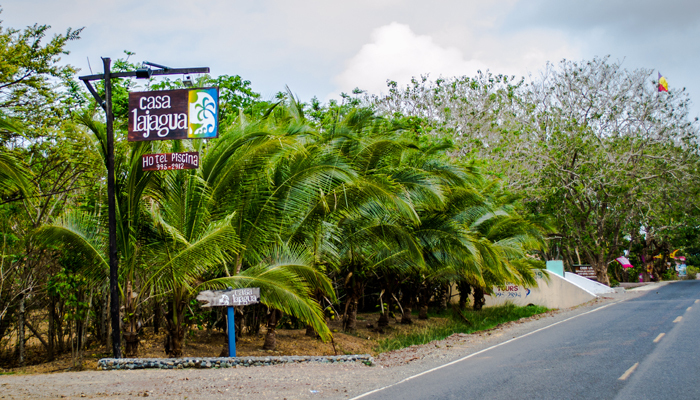 We hope you enjoy your stay at Casa Lajagua in beautiful Pedasi!